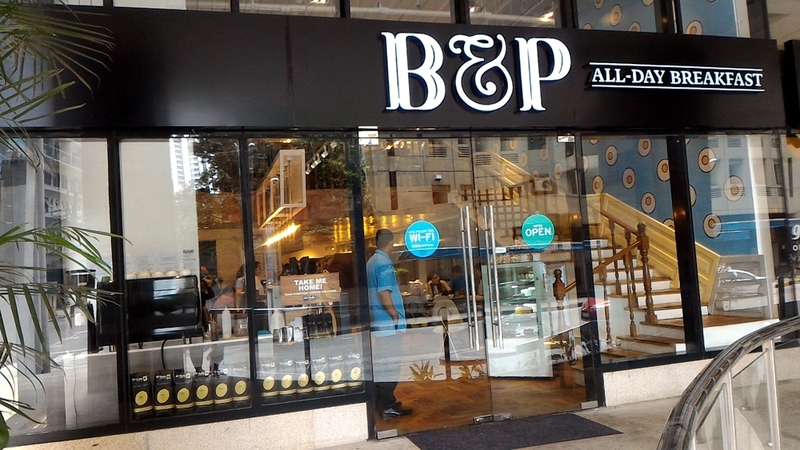 B&P is the newest casual dining restaurant that offers a modern take on well-loved breakfast specialties. It is under the Cravings group. The name came from Bea and Pia Trinidad, the grand daughters of the owner Annie Guerrero. 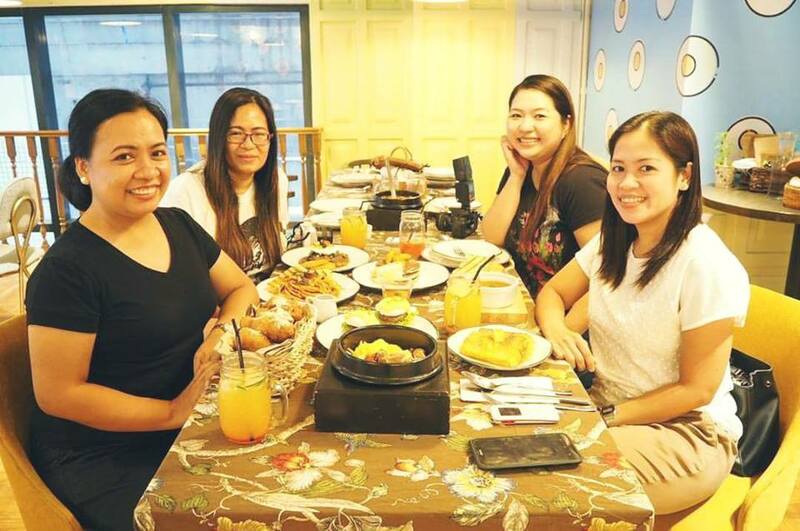 I was invited to try some of the items in their menu with my kumare bloggers a few days ago. We went to their Ortigas branch that’s just a few blocks away from Robinsons Galleria. It can be found at Cyberscape Alpha Building to be exact. As you can see, the area is covered with sunny-side up wallpaper. The chairs are designed like a bed headboard. It will really make you feel having breakfast at your own sweet home. They said that because the headboards are high it can give you a little privacy because you wont be able to hear the other table besides you. Beside the chairs and tables is the open kitchen where you can see through the staff and chef on the move. The counter is simple but also quite fascinating. I like handwritten menu. B&P’s Caesar Salad has fried wanton, tossed in tinapa dressing and topped with salted egg. This is my fave soup from the 2 they served us. The broth is flavorful, it has pork wontons, carrots and cabbages. It is creamy and yummy, perfect for a cold day or when you’re not in the mood. It’s a different take on Egg’s Benedict. It consists of poached egg, chicken longganisa on a malunggay pandesal topped with hollandaise sauce. The battered chicken is good, it is crispy from the outside but juicy inside. It is served with french toast (that is cooked in perfection). I think my son will love this dish. 2 to 3 people can share this dish. This is one of the dish I love here. I can say no to other pork dishes, but not with a bacon especially if it’s as crispy and good as this one. It’s served with adobo rice and your choice of egg. It’s Prime Angus Beef Tapa, with pickle relish, adobo rice and your choice of egg. If you don’t like pork then this one is for you. It’s an all-beef patty in red wine demi-glace topped with spinach and poached egg. It is served with hash brown too. I don’t like this dish much but I think those who are looking for something different will like it. To be honest, I prefer this version more than iHop. Kids will surely enjoy this fluffy pancake. B&P made a secret pancake mix and you can have it with your choice of spread (peanut butter, Speculoos, coco jam,dulce de leche, or Nutella), and topped with caramelized bananas. These are the cakes that were served as our dessert too! A coffee demonstration was done after our hefty meal. They will do it at your table so you can see how they process it. Their coffee taste awesome by the way. If you’re looking for a cozy place to hang-out with your friends or a gathering for a family thing, then visit B&P All day breakfast. Oh may Ortigas branch na, I wonder if the QC one is still open. Food looks good! I love B&P! Their pancakes are the best! Food looks super yummy. I love breakfast food especially when matched with a good ambiance. Your photos look inviting, I’ll try this place one time! Thanks for sharing! I love the ambiance of the place! The food looks good too. I hope they open a branch here in the South so that it can be more accessible to us. That’s what I told them too. Oooh, I love breakfast! Because I so love eggs! Thus, that wallpaper is super like! I will try to visit the place sometime as it’s close to home. you should mommy, the place is cozy. The place is too adorable for words! It just looks like the perfect “hohol” place. I’ll surely check it out on my next trip to Manila! I hope they will have a branch near your area soon. they also have smores, this one is a must try too. I like the ambiance and the food looks sumptuous. Would love to have our lunch here someday. Thank you for sharing.